Author's Note: This review is in conjunction with the 2015 TCM Summer Under the Stars Blogathon taking place at the Journeys in Classic Film site. Today we celebrate Ingrid Bergman, one of the true legends of cinema. While best known for film, I've selected her final performance, the miniseries A Woman Called Golda, the life story of Israeli Founding Mother and Prime Minister Golda Meir, with Bergman as the title character. Thanks to Kristen at Journeys in Classic Film for allowing me to participate. Ingrid Bergman always found it odd that she, a tall Swedish Protestant woman, would be asked to play Golda Meir, a short Jewish woman. It is a testament to her as an actress that she made herself so like Prime Minister Meir that the resemblance now seems obvious. A Woman Called Golda was Bergman's final performance, and it is an excellent farewell to one of the great actresses of the Twentieth Century and an excellent narrative of one of the icons of Israeli history. A Woman Called Golda covers Meir's life, with the story anchored by Meir's visit to her old elementary school in Milwaukee, Wisconsin. Little known fact: Golda was essentially American, as she helped create the Jewish state known as Israel. Here, the elderly Golda (Bergman) answers questions from the children, with her lifelong friend and aide Lou Kaddar (Anne Jackson) reminiscing to herself from time to time of Golda's extraordinary journey. After surviving a pogrom in her native Russia, Golda dreams the Zionist Dream: a Jewish state in Palestine. Her family comes to America, and a young Golda (Judy Davis), while thankful that she is in America where Jews can live free from fear of violent attacks, has not let the dream go. She yearns to go to Palestine and live in a kibbutz, much to the consternation of her beau, Morris Meyerson (Leonard Nimoy). Morris is faced with a difficult choice: he loves Golda, but has no desire to go to a kibbutz. She won't marry him unless they both go to Palestine, and he doesn't want to go. However, go they do. Life in the kibbutz is hard, but Golda thrives to leadership. Morris does his best but health issues eventually force them to leave and settle in Jerusalem. Virtually broke, Golda has an unexpected reencounter with an old kibbutz friend, Ariel (Jack Thompson), who sees how good Golda is in leadership. He persuades her to go to Tel Aviv and be part of the Zionist movement, causing a permanent rift between her, Morris (who separate but never divorce) and their children. She finds the balance between being a mother and being a Zionist hard. As the older Bergman moves higher and higher, she is a passionate advocate to creating the Jewish state despite the stiff opposition of both the British in their Palestinian Mandate and the Arab population who cannot stomach a Jewish state. This becomes more imperative after the Holocaust, where the influx of Jewish survivors into Palestine is causing headaches for just about everyone in the region one way or another. Golda, moved by Jewish children who have never seen a flower, is determined to bring as many to Palestine and to form the Jewish state. She does go to Jordanian King Abdullah (Nigel Hawthorne) to plead for peace, but he is not helpful. Despite it all, the State of Israel is formed and declared. On the eve of Independence and the establishment of the Jewish state, Morris and Golda have one final meeting. Morris is happy that the Jewish people now have a land of their own, but he and Golda both know it's come at a high personal cost. We go to 1948. Israel is declared into existence, and Golda becomes one of the few women to sign the Declaration of Independence. She finds herself fighting all sorts of battles, from the major ones against the Arab states determined to wipe Israel and the Jewish people out of existence, to the surprisingly prudish nature of American Vice President Hubert Humphrey (Franklin Cover), who is shocked that people are living together outside of marriage. Golda, in her diplomatic way, has to persuade young Jewish people to marry to placate the American. She is part of government and thrives as Labor Minister, finding herself a better (and stereotypical) Jewish grandmother than she was a Jewish mother. Israeli Prime Minister David Ben-Gurion (David de Keyser) is saved from assassination in the Knesset by Golda, who is injured with shrapnel in her legs. While recovering from her injuries, the wily head of state asks Golda to become Foreign Minister. She balks at the idea at first, but reluctantly agrees. He also presses her to adopt a Hebrew name in keeping with his policy, and Golda Meyerson becomes Golda Meir. After she is widowed (regretting how her duty separated her from the man she loved), she finds a semblance of romance with Ariel, who presses her to marry him. Just as she's about to say yes, Ariel himself dies of a heart attack. Privately devastated, she soldiers on, until she retires from public life. 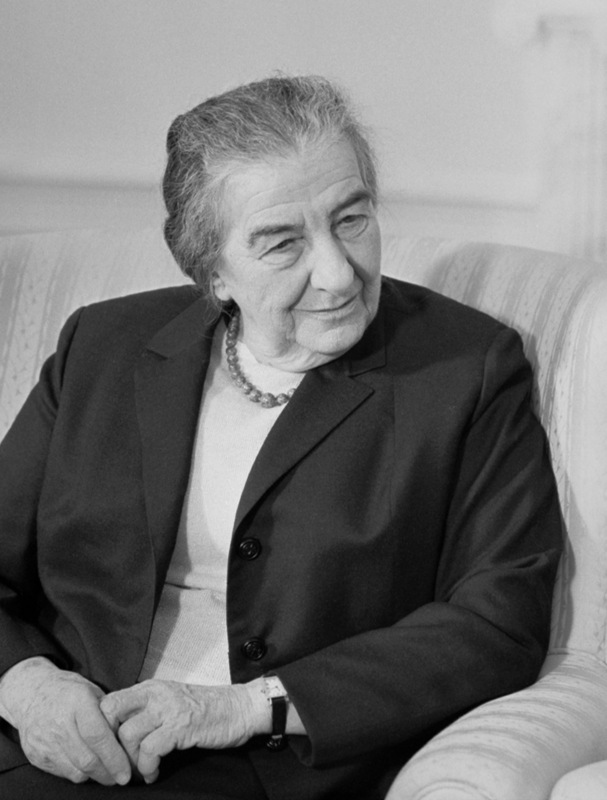 The unexpected death of the Prime Minister pushes the Labour Party to select Golda Meir as Israel's fourth Prime Minister its first female head of state. She goes against her own instincts to strike first and the Yom Kippur War almost succeeds in wiping Israel out. Only through the arms from the United States and the rallying from Israel troops under legendary military figure Moshe Dayan (Yossi Graber) does Israel push back. Still, the high cost of the war brings an end to the Meir government. Once again out of government, she is recalled one last time to help with negotiations with Egyptian President Anwar Sadat (Robert Loggia). At the end, she finds herself as the Mother of Israel, still sharp-tongued as ever, but with a quiet satisfaction that she has been instrumental in fulfilling that Zionist Dream of so long ago. I find voice-overs quite difficult to bear in film, and A Woman Called Golda has two of them. We get the voice-over of Meir herself in limited quantity, and most of them come from Kaddar's perspective. I never understood why the makers of the miniseries opted for this method when for long stretches there were no voice-overs. Sometimes they worked (hearing from Meir how working to being a mother to Israel separated her from her role as a mother to her own children is sad), but other times I felt they could have dispensed with that. The more curious thing about this dual voice-over business was that in all that, I cannot remember how Kaddar and Meir met, let alone why they were such close friends. They did have wonderful moments together (Meir had done her best to hide her lymphoma from Kaddar and the public, but when she finally had to have secret treatments, the silent understanding between Kaddar and Meir is played so well between Jackson and Bergman. There is also the question of casting. Seeing the British Hawthorne in brown makeup as the Arab King Abdullah is not too bad, if a bit questionable. However, nothing excuses the casting of Italian-American Robert Loggia as the black Sadat. Loggia did his best to try to both sound and look like Sadat, but the makeup work looked obvious and Loggia's distinctive voice still broke through. Curiously, a year after A Woman Called Golda debuted, a miniseries about Anwar Sadat appeared in the United States. Sadat at least cast an African-American actor (Louis Gossett, Jr.) as Sadat, and if one were to ask someone whether Gossett, Jr. or Loggia was closer to Sadat's appearance, I think the former would win. This question of casting is important, because again on the surface it would appear to be completely wrong to cast the glamorous Scandinavian as the Hebrew heroine. However, Bergman does a marvel as Meir. She adopts an excellent accent and does her best to look like Meir. Obviously they will never bear a similarity, but Bergman's performance is excellent throughout. Whether she is angry at the slow pace of movement, horrified at the violence, fearful that Israel will fall due to her own rare and uncharacteristic timidity, or heartbroken that there are innocent children who have never seen a flower, Bergman does become Meir. Bergman never plays Meir as a woman conscious of making history. Instead, she plays her as a woman who sees something that needs to be done and does it. Her best scenes aren't the ones where she is doing something important or historic. Instead, Bergman's best moments are when she plays the private Golda. Her final scene with Nimoy's Morris is so heartbreaking. Both of them, who have shared so much but who found that her calling was not his, say their farewells. Both know she accomplished a miracle, but both know it came at an enormous cost to their own private happiness. As Morris walks away, we see Golda wants to call out to him, but she can only stand there and suppress the tears she longs to cry. A Woman Called Golda is a fine farewell performance from Ingrid Bergman, who like Meir, defies the odds to show us what an extraordinary talent she was. Bergman was ill with breast cancer at the time she made the miniseries and would die four months after the miniseries' debut. It's interesting that both Meir and Bergman showed personal courage despite intense odds against them. Perhaps this is one reason why Ingrid Bergman seems so perfect in the role of Golda Meir. That, and the fact that Ingrid Bergman was one of the Twentieth Century's finest actresses.